The festival over the weekend of the 10/11 July was a great success attracting many visitors despite the weathers efforts! 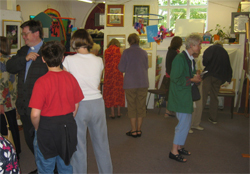 The school hosted a lovely art exhibition, a display of some of the villages archive material, a giant mosaic making session and splendid refreshments. 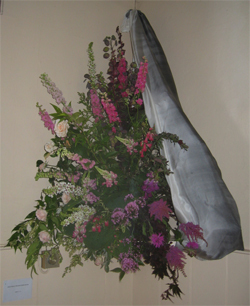 In the church a beautiful themed flower display was staged, described below in detail. 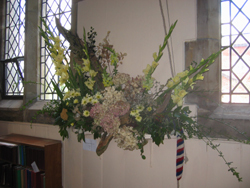 St. Mark's is a small and very rural church so we have chosen to use wild and garden flowers where possible. 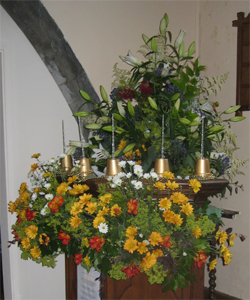 The theme of our Flower Festival, "Revealing His Glory" is taken from the writings of St. John, in his Gospel and in the Book of Revelation, where we learn how God has made Himself known to us. John has revealed the Heavenly Father to us through Jesus' words and ministry. We trust that these notes will assist you to understand the inner meaning of the Scriptures, which we have attempted to portray. Jesus shared the modest meal of loaves and fishes with the huge crowd, which had gathered to hear Him preach. We are part of that crowd. We are reminded that God meets our real needs. 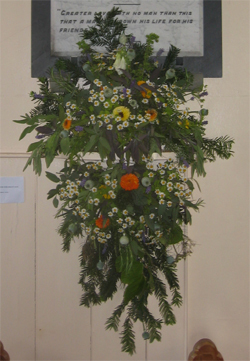 The crowd, represented by the ring of flowers, could be compared to those at a modern day pop concert. Look for the family groups, the clusters of friends, couples, loners, the sick and the weary. Light is an intangible force without which we cannot live. 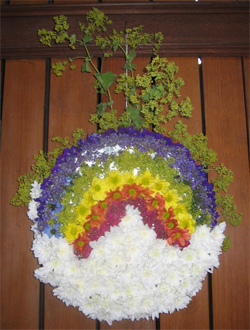 Broken down through a prism, it gives us the colours of the rainbow shown here, with white, the lightest and brightest colour available in flowers, representing the Light of the World. God calls us to move from the shadows, so that we may live in this glorious light. Abraham, father of the Nations, is depicted by the mature, weathered wood. 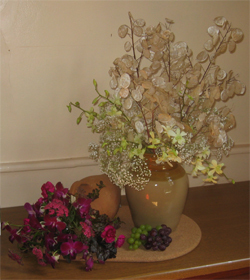 The dried flower heads represent past generations, fresh flowers, the present one and seed heads, those still to come. Whilst we may change, God never changes. He is the same yesterday, today and forever. The beautiful arrangement is masked in part by a veil, like a cataract. We, who can see want to remove the veil to see the whole. Similarly, the blind man wishes to see clearly, so puts his trust in Jesus' healing powers. On many occasions during His ministry, Jesus was called upon to heal the sick. 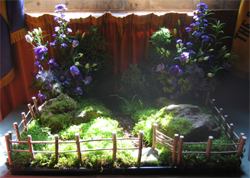 We have chosen to portray this by the use of healing and beneficial plants from our gardens, among them, foxglove, yew, eucalyptus, sage and fennel. John points to a greater healing when he refers to The Tree of Life, whose leaves were for the healing of the Nations. Jesus approaches the fishermen's boat, which is being tossed on the blue-green Sea of Galilee. He comes to us in our everyday lives, but occasionally, He comes in an extraordinary manner. Where water and raw food can easily become tainted, the purest, basic ingredients for life are cooked bread and fermented wine. Thus, Christ should be the staple ingredient of our spiritual lives. 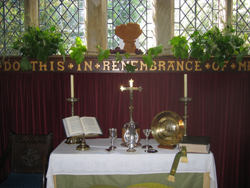 The bread and the wine point us to the Holy Communion, when we remember the cost, the broken body and the shed blood of the Crucifixion. John tells of his vision of the risen Lord and in symbolic language, describes the power and authority of Jesus. This, he relays to the known Church of the time, represented here by the seven candlesticks. 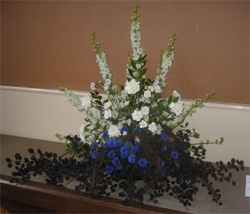 In this arrangement of three layers of colour, black represents death, blue, the days in the tomb and white, the hope of resurrection. Jesus was a country boy. He understood the importance of using safe paths and defined gateways. Thus, He describes himself so that, through Him, we may find a sure way in this life and also, the way to the Gate of Heaven. Jesus' first miracle was performed at the wedding in Cana, where He changed water into wine. 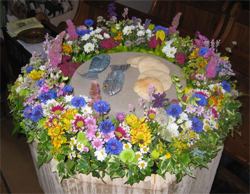 Here, the water is depicted in white and sparkling flowers and the wine in purple and magenta. Jesus stepped in to provide the means for people to celebrate. Likewise, God enables us to celebrate the good things in life. 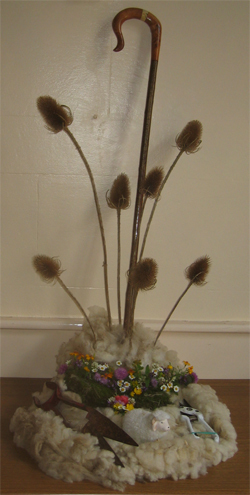 The shorn fleece is arranged with the shepherd's tools, crook, shears and foot trimmer together with teasels, traditionally used to tease the tangled fleece into orderly threads for spinning. The shepherd guards his flock and cares for its every need, as Jesus cares for us. PLEASE SUPPORT OUR EFFORTS WITH A GENEROUS DONATION TO HELP FUND THE NEW SCHOOL HALL AND THE REFURBISHMENT OF THE CHURCH. Jill Kitchenham, Sheila Lawrence, Muriel Muddle.